Precision Cable Assemblies > Case Studies > What are 5 Benefits of Electrical Cable Overmolding? Cable overmolding is a controlled process of injecting thermoset materials into a mold cavity, while under pressure. This process encapsulates electrical wires and connectors. The combination creates a single, seamless electrical component assembly that is impervious to harsh environmental conditions. Impervious to fluids, cable overmolding is perfect for harsh environment exposure. By keeping out dust, water, dirt, debris, chemicals and moisture – overmolding increases the IP rating of the cable assemblies and connectors. PCA’s custom color options allow Original Equipment Manufacturers (OEMs) to increase production rates by eliminating human error during assembly, thereby eliminating faulty assemblies and reducing production costs. 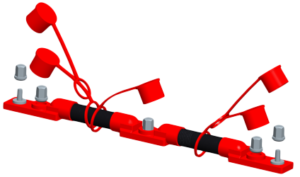 Cable overmolded assemblies can withstand the shock, vibration, continual flexing and abrasion, preventing damage to termination points and contacts. This ability to withstand abusive circumstances, means electrical cable overmolding helps prevent fraying and corrosion to internal connector parts thus increasing component life. PCA’s Overmolded cables not only keep out harsh conditions, they also prevent human tampering. They eliminate manual assembly during initial production and part replacement so electrical system fault due to human error is virtually non-existent. Cable overmolding design and manufacturing methods typically results in smaller cable assemblies, which is particularly important in current equipment designs that typically have significant spatial constraints. For a custom evaluation of your cable overmolding needs, contact PCA today. Their overmolding expertise is highly recommended for electrical cable assemblies.